We’ve taken the best elements and ingredients of traditional southern cooking and added a bold flavors. Christian Buze has honed his recipes for years, starting when he was a kid working in his grandmother’s restaurant, the famed Mrs. White’s Golden Rule cafe. From that solid training ground, where his grandmother recognized and encouraged his talent, “Chef Buzz” began to try new cooking methods and bold ingredients. 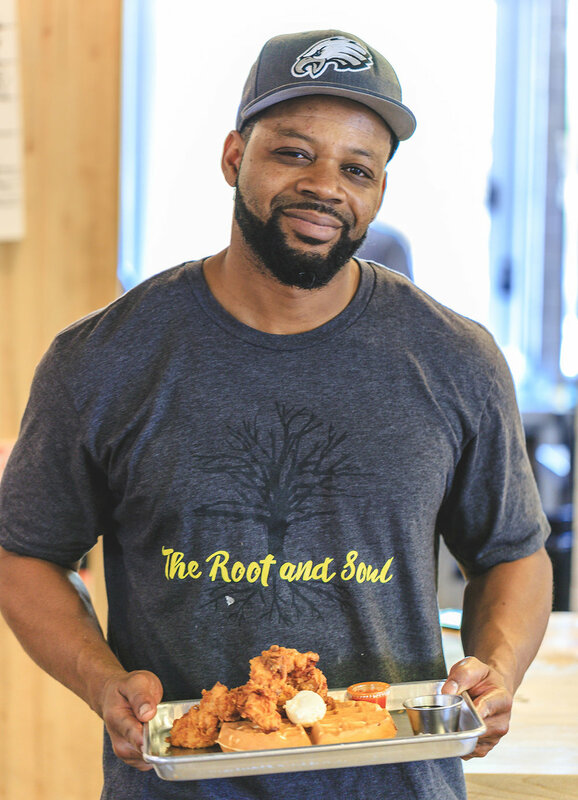 What makes each menu item at The Root and Soul unique, satisfying and so delicious is the deep respect for the cooking process and ingredients. The catfish is flown in daily and all of the other ingredients are locally sourced. From the Belgian Waffles infused with maple sugar to our secret cajun inspired seasoning and our aioli sauce, each menu item is crafted to bring out the best of every ingredient. For example, our catfish never touches a deep fryer, instead we prepare each entree in huge cast iron skillets. To keep the texture crisp and light we have perfected a light buttermilk dredge, instead of cornmeal. Starting at a young age, Chef Buzz and his three siblings worked alongside their grandmother, the proprietor of Mrs. White’s Golden Rule Cafe. He admits that she was a stern boss and taught the children the value of hard work. When Chef Buzz showed that he had a flair for cooking and was bitten by the restaurant bug, his grandmother began mentoring him and sharing all of her secrets. From there he began to try new recipes and the dream of having his own restaurant took root.